Bluecrowne, Kate Milford (Clarion Books 978-1328-466884, $17.99, 255pp, hc) October 2018. In this prequel to The Left-Handed Fate and her popular books about Greenglass House, author Kate Milford ties together elements from across her sprawling literary landscape to show how, basically, a whole lot of things hap­pened for the first time. It is unnecessary to read any of her other books to enjoy Bluecrowne, however, although new readers will likely want to move on from this one to the others in quick succession. Early in Bluecrowne, readers meet young Lucy Bluecrowne, who is devastated to be viewing her new home in the port town Nagspeake. It is not family issues with her younger half-brother, father, and stepmother that upset Lucy, but rather the very notion of having to live on dry land. 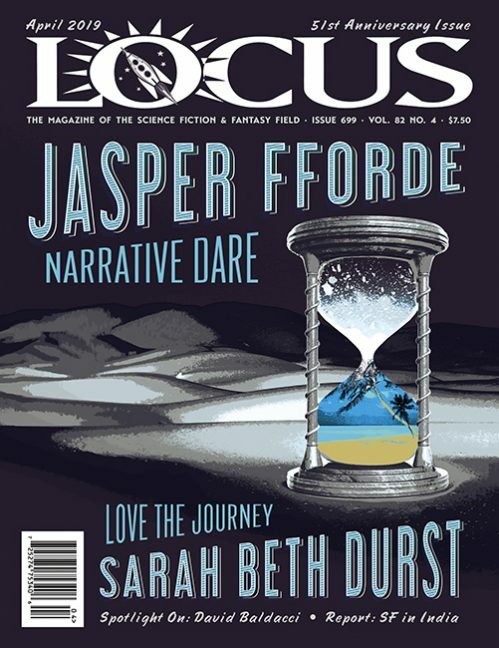 After spending all her life on her father’s ship of war, the Left-Handed Fate, Lucy is at home on the water and even though she was gravely injured in a recent battle, her father’s insistence that his family be removed from the ship is deeply unsettling. Lucy does not know how to live away from the water, and she doesn’t want to find out. Nagspeake is Milford’s fictional seaside city somewhere along the Atlantic coast of America but not American (or British or French in this 19th-century-esque outing that takes place in a time of war). 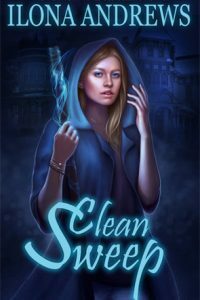 As her longtime readers know, mystery seeps into every nook and cranny of Nagspeake and ghostly magic in particular is never far. Lucy is a practical girl, but not afraid to embrace the wonder around her. She is also abundantly aware that her younger brother Liao’s talent with fireworks, learned in his native China, is far more spectacular that one can imagine. 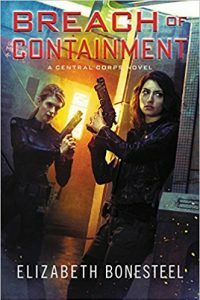 Just how amazing that talent is anyway, is a significant plot point to the novel and propels the narrative along at a breakneck pace. There are two dastardly villains introduced in the book’s first pages (an introduction that might seem confusing at first – just stay with it). Just how dastardly they are becomes clear in the pages that follow and the battle Lucy must wage against them is intense. These men call to mind all those who play with people’s lives as chess pieces on a board, willfully ignorant of the havoc they wreak or the pain they cause. They will say – they always say – that it is not for them to make decisions but merely to follow orders. But their hands are tainted in the blood of many and in the case of the Bluecrowne family it is a heavy price that is paid to defeat them and spoil their horrifying plans. While the magic comes fast and hard as the plot surges along, it is Lucy’s personal evolution that is most intriguing. “Let it be a lesson,” her stepmother tells her at one point. “It does not do to ignore the little voices that whisper when something is not right.” Lucy takes this bit of advice to heart and uses it as her guide as the magical battle unfolds. One of Milford’s great talents is her ability to weave this sort of wisdom into the narrative without drowning her stories in lessons. Her child characters are never stupid, and they only get smarter with each successive adventure. It’s a broad journey Milford is taking her readers on, a journey through the lives of several young characters in an imagined world as they face hor­rors as old as time. Lucy and Liao have their first challenge in Bluecrowne, and it is a desperate one leaving them both humbled and heartbroken. The Greenglass House history is revealed, which sets up two other books (Greenglass House and Ghosts of Greenglass House), but this is a writer who is nowhere near done with all the stories she has to tell. 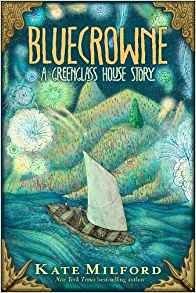 Bluecrowne is just another chapter from a lively authorial mind and I sincerely hope there are many more adventures for all of Milford’s characters to come.